Because the round cedar picnic table project was going to sit outdoors in hot Kentucky summers and brutally cold winters, I wanted the cedar to have all the protection I could provide. I started with CPES: Clear Penetrating Epoxy Sealer, two coats. From there, I added several coats of Epifanes varnish, all clear gloss except matte for the last two coats. However, I found Epifanes to be so thick that it required serial dilution. This is where the cheap part comes in. Saved salsa jars allowed me to pour in some Epifanes plus a diluent. It was easy to fill a jar 25%, then add an equal amount of thinner for 50:50 dilution, or 2:1 or 3:1, depending on how thin I wanted it. Having been reared by five children of the Depression, I can throw away almost nothing. That goes for jars, too. Jars of all sizes and shapes. If we empty a jar, Brenda gives it to me straight out of the dishwasher. From there, the jar-saving process goes through the steps pictured below. Ventilated shelving allows the jars to dry completely with good air circulation. The accompanying lid is close by. Regular readers won’t be surprised that I “salvaged” this shelving on trash pickup day. I have over 100 feet of this shelving in various areas around the garage. Frequently, I find the brackets included with it. About $300.00 retail value. After a while, defined as “when I get around to it,” the lids go on the jars to keep them dust free. However, dust doesn’t rise well, so, as long as the jar is upside down, it’s going to stay clean. It would be valuable to post a follow-up assessment of the weather-proofing method. 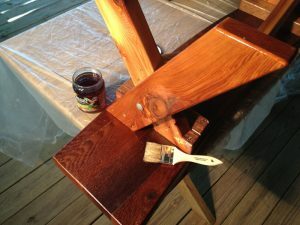 I used this formula a few years ago for a couple Western Red Cedar chairs that I built. I believe the “formula” was one of several tested in an article from Fine Woodworking. And, found to be the most durable in that article. By-the-way, using Epifanes does not make you cheap! I am in western Washington where it rains 8 to 9 months, and then is Death Valley dry during summer. We also have hundreds of years of cedar weathering examples in coastal First Peoples housing and art to judge. But, progress always wants to prove itself. In my test, one chair was epoxy-Epifanes, like yours; and the other only Epifanes finished. The test is not scientific, but neither finish survived intact over a single year. One shed flakes like a redhead’s skin after a healthy dose of sunburn–even better. I think the epoxy-Epifanes chair held scales of finish the longest on exposed surfaces, but once the edges were opened continued to flake into surfaces free from rain and sun. My wife wanted at the time, and now, a type of milk paint finish. So, clear to blue, … or green, … all the choices. 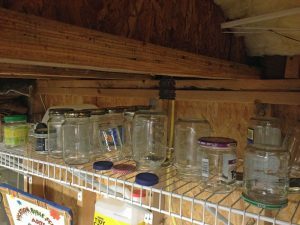 Making Slots – Tips from Sticks in the Mud – March 2018 – Tip #1 March Woodworking Poll: How Do You Heat Your Workshop?